David Suzuki is one of Canada's best-known environmental activists. 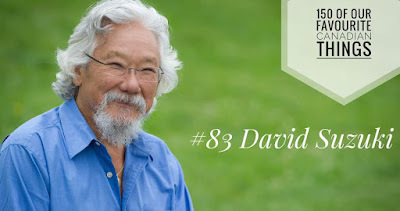 Now age 81, he is an endearing figure to generations of Canadians, due in part to his role on television programs such as The Nature of Things and Suzuki on Science. Born in Vancouver, BC, Suzuki and his family were victims of Canadian government internment during the Second World War. The government sold his family’s business and they were forced to move east of the Rocky Mountains after the war. Suzuki went on to earn his PhD in Zoology and began a successful broadcasting career in 1970. In recent years Suzuki has been an outspoken climate change activist, noted for his criticism of governments for not doing more. He is Canada’s answer to Neil deGrasse Tyson (or perhaps, more accurately, Bill Nye) and is respected both in Canada and abroad for his important and impassioned views.